Ankle replacement? How bad is it? Have you dried off from your most recent visit to the Y’s water aerobics for arthritics? Not there yet? Today I want to share information about replacing those joints that just keep hurting so much that you prefer to sit or lie down rather than try to move through the pain. My favorite website for the latest procedures is Johns Hopkins Medicine. This week they have an article about ankle replacement. Replace your ankles? Oh, my goodness. It would have to be really bad before I’d do that. My own experience with arthritis in the ankles came as a result of breaking the left ankle while cross country skiing in 1997. 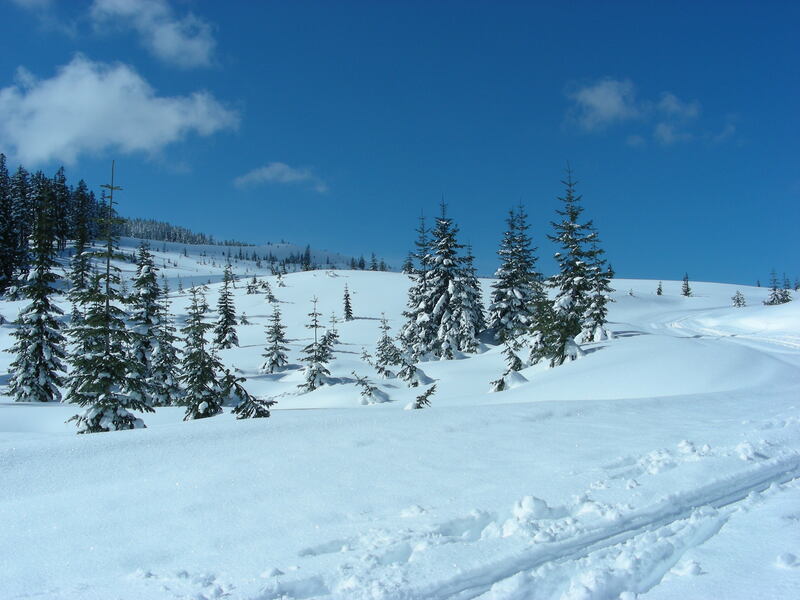 The snow conditions were our usual white cement so often prevalent in the Cascade mountains. The Women on Wednesday group I ski with had chosen the Swan Lake trail that begins along Lake Kachess and then rises through twists and turns to an upper plateau. We have never made it to Swan Lake. It must be there somewhere. Our ski day usually begins with a couple hours of climbing on skis, then lunch in a nice trail side spot, followed by another 20 minutes uphill to warm up. Then we usually turn around and come down. These logging roads are never groomed except by the occasional snow mobile. Snow mobiles can create moguls that make skiing even more challenging than breaking trail. If the uphill has been through new snow, even cement (heavy) snow, the downhill can go quite well. On the particular day of the breakage, I was doing my usual fast downhill and on one curve, planted the tip of my left ski squarely into a snow bank. My body continued on. I could hear the snap. It was possible to ski out the remaining 4 miles or so by keeping the left leg slightly bent and the foot rigid in the boot, using the polls and right ski to snow plow. On the bus, a fellow skier and nurse, filled a sandwich bag with snow and wrapped my ankle with an emergency tape. The next day, an x-ray revealed a hair line fracture which they cast. I was in this non-weight baring thing for 60 days and a walking boot for another 30 days. I worked hard to keep the muscles functional with all sorts of floor exercises including leg lifts in all directions, and was ready to walk as soon as they gave the go ahead. Now, fifteen years later, I am getting little twinges when setting off on a hike or long city walk. Do I stop? Is it harmful to keep going? I can report that I may slow down a bit, exercise great care in foot placement and gait, and above all keep going. So far so good. The pain doesn’t stop me and the ankle is still functioning well. Will it get worse? Probably. Will I go for surgery someday? Who knows. I would recommend doing every possible thing before going there. If you do read the article at the link, you’ll see that people have good results. Are they hikers, cyclists, climbers? Or are they people who just want to be able to walk around their house when the pain has become so unbearable they are confined to a chair? Osteoarthritis and arthritis caused by injury often come down to the same thing as one ages. I prefer to take hands full of supportive supplements to 3 Advil because I am sure that the supplements strengthen tissue and feed cells for better all over health. Advil will mask the pain for sure. It is pretty conclusive that vitamins, minerals and protein build healthy tendons, muscles and bone. There may still be pain. Try an herbal pain inhibitor first. Shaklee makes a good one. If you want to explore these, go to HiHoHealth dot com. We have a Pain Relief page there. The Johns Hopkins site on arthritis gives good information about the other joint replacements as well. Good luck if you are facing this decision. If you want to talk more about your options with a person who has been dealing with arthritis for 35 years, I’d love to hear from you at 206 933 1889. If you would like to comment, please do.